Like Mr T’s endorsement of the Flavorwave Oven, this is another instance of a 1980’s icon reduced to ransacking his decades-old pop culture persona to peddle a product. But at least the Flavorwave Oven didn’t mock Mr T’s life’s work every time someone used it. 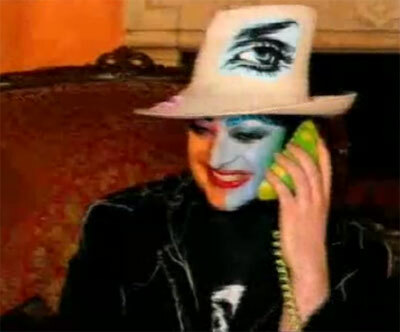 Other than the desperation that must have led Boy George to agree to this, the most appalling thing about the Karma Chameleon phone is that it costs $69.95and this outlandish price is touted at length as some sort of selling point! “Don’t expect to pay $120 or $100.” I wasn’t, thanks. 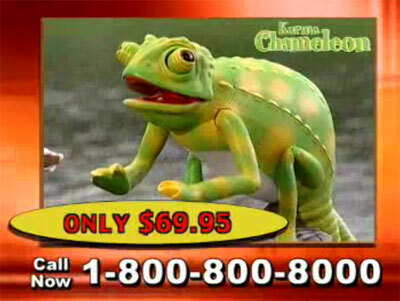 Although the Karma Chameleon telephone infomercial looks more like a comedy sketch than a real advertisement, the product was real. You can read this article about it from Entertainment Weekly, find it for sale on Ebay, and watch this video of a man’s Karma Chameleon phone in use. The BT advert (as they say in the UK) was promoting free evening and weekend calls and not selling the phone at all. 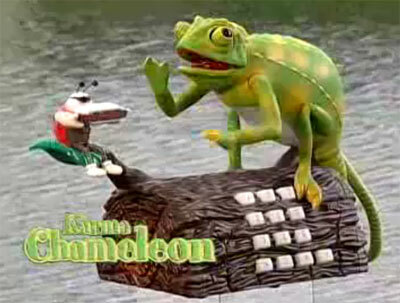 Nonetheless, many in Britain wanted the Karma Chameleon telephone and it was soon put into production. The infomercial was an attempt to introduce this novelty item to the US market, but without the prior publicity generated by the BT commercial the overpriced phone with a reptile singing a 20-year-old pop tune promptly failed in America. 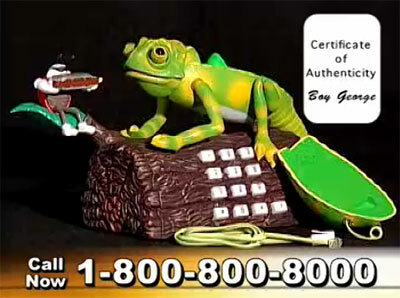 A red, gold, and green thank you to TheOldOakSyndicate for letting us know about the Karma Chameleon telephone infomercial! I felt sorry for Boy George doing this commercial…until I realized that anyone who willingly goes around dressed like that is beyond humiliation. Those stoned frat boys in the beginning of the infomercial would probably beat up Boy George if they ever met him. Wow. Talk about desperation. Then again since he took a pounding on that play he & Rosie O’Donnell backed, he could probably use the coin. As I understand it now he’s flat broke. Even still though no matter HOW bad I was off financially I don’t know if I could ever lower myself to do this. BUT THE CORD IS GREEN PEOPLE!! GREEEN! I never knew I needed this phone. Wonder if it can work with Drama-Tel?